The search for a Guru is always a tough task for the spiritual seeker. What qualities make for a good Guru? What are the responsibilities of the shishsya (seeker) and the Guru? 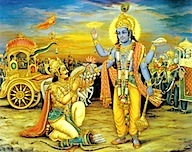 The venerable Bhagavad Gita provides us with some clues. Approach the teacher by humble reverence, by inquiry and by service. The men of wisdom who have seen the truth will instruct thee in knowledge. Wise men will teach us the truth if we approach them in a spirit of service and reverent inquiry. Humility is essential if we want to partake of true spiritual knowledge from a Guru. Until we realize the God within and experience self-realization, we have to trust the advice of those who have had the experience of God. However, we should not accept or take on face value what is said in the sastras or taught by the Guru. Religion must stand the test of reason. We must combine devotion to the teacher with the spirit of free examination and inquiry. Blind faith and adherence to authority is not the path to self-realization. If the spiritual teachers or Gurus require their followers to obey and follow their dictates blindly, it can only lead to the death of the intellect. Swami Vivekananda also cautions against such blind faith because it can only lead to superstition. Many credulous and simple-minded people are drawn to such Gurus not so much by their spiritual powers but by their own weakness for novelty, curiosity and excitement. Blind faith is against the Hindu tradition – which insists on jigyasa or inquiry, manana or reflection or pariprashna. However, solitary dependence on the intellect is also insufficient. The intellect may give glimpses of the Beyond, but it does not give the consciousness of the Beyond. We must open the whole of our inner being to establish personal contact with the supreme. The ultimate authority is the inner light which is not to be confused with the promptings of desire. Truth achieved through meditation and self-realization is different from truth imparted from outside. Ultimately, what is revealed in the scriptures (pranipata shravana), what is thought out by the mind (pariprashna manana) and what is realized by the spirit through service and meditation (seva nididhyasana) must agree. We start our spiritual life with faith, then comes knowledge, followed by experience. We must consort with the great minds of the past, reason about them and intuitively apprehend what is of enduring value in them. Those who have experienced the truth are expected to guide us. The seers owe a duty to their less fortunate brethren and guide them to the attainment of illumination which they themselves have reached. Have you found a Guru yet on your spiritual path? Will this article help you identify a Guru? Tell us in the comments section!